Rap metal is a subgenre of rap rock and alternative metal music which combines hip hop with heavy metal. It usually consists of heavy metal guitar riffs, funk metal elements, rapped vocals and sometimes turntables. The term rapcore has been used in reference to rap metal. With the release of its extended play I'm the Man, Anthrax (pictured) is considered one of the pioneers of rap metal. Rap metal originated from rap rock, a genre fusing vocal and instrumental elements of hip hop with rock. The genre's roots are based both in hip hop acts who sampled heavy metal music, such as Beastie Boys, MC Strecker Cypress Hill, Esham and Run–D.M.C., and rock bands who fused heavy metal and hip hop influences, such as 24-7 Spyz and Faith No More. Scott Ian of Anthrax (who helped pioneer the genre) believes Rage Against the Machine invented the genre. In 1987, the heavy metal band Anthrax fused hip hop with heavy metal for their extended play I'm the Man, and then were teamed up in 1991 with Public Enemy for a remake of the latter's "Bring the Noise" that fused hip hop with thrash metal. Also in 1991, the thrash metal band Tourniquet featured the hip hop group P.I.D. on the song "Spineless" from their album Psycho Surgery. The next year rapper Sir Mix-a-Lot teamed up with Metal Church for his 1988 single "Iron Man", loosely based upon the Black Sabbath song of the same name. In 1990, the rapper Ice-T formed a heavy metal band called Body Count, and while performing at the 1991 Lollapalooza tour performed a set that was half rap songs and half metal songs. Stuck Mojo and Clawfinger, both formed in 1989 are considered to be another two pioneers of the genre. 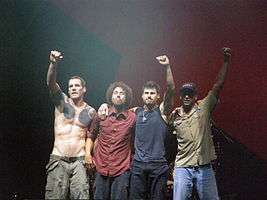 Rage Against the Machine (pictured) is one of the bands that helped pave the way for later rap metal bands such as Limp Bizkit. In the 1990s, rap metal became a popular style of music. For instance, the band Faith No More's song "Epic" was a major success and peaked at number 9 on the Billboard Hot 100. 1993 saw the release of the Judgment Night soundtrack that featured numerous collaborations between rappers and rock bands. Rage Against the Machine's 1996 album Evil Empire entered the Billboard 200 at number one, and in 1999, their third studio album, The Battle of Los Angeles, also debuted in top spot in the Billboard 200, selling 430,000 copies in its first week. Each of the band's albums became at least platinum hits. Biohazard played on the Ozzfest mainstage alongside Ozzy Osbourne, Slayer, Danzig, Fear Factory, and Sepultura. In support of the album, Biohazard embarked on a short co-headlining tour of Europe with Suicidal Tendencies. On August 18, 1998, Atlantic released rap metal musician Kid Rock's Devil Without a Cause behind the single "Welcome 2 the Party (Ode 2 the Old School)" and Kid Rock went on the Vans Warped Tour to support the album. Sales of "Welcome 2 The Party" and Devil Without a Cause were slow, though the 1998 Warped Tour in Northampton, Massachusetts stimulated regional interest in Massachusetts and New England. This led to substantial airplay of the single "I Am The Bullgod" during the summer and fall of 1998 on Massachusetts rock staples WZLX and WAAF. In early December 1998, while DJing at a club, he met and became friends with MTV host Carson Daly. He talked Daly into getting him a performance on MTV and on December 28, 1998, he performed on MTV Fashionably Loudin Miami, Florida, creating a buzz from his performance, even upstaging Jay-Z. In May, his sales began taking off with the third single "Bawitdaba" and by April 1999, Devil Without a Cause had achieved a gold disc. The following month, Devil, as he predicted, went platinum. Kid Rock's first major tour was Limptropolis, where he opened for Limp Bizkit with Staind. He solidified his superstardom with a Woodstock 1999 performance and on July 24 of that year, he was double platinum. The following single "Cowboy", a mix of southern rock, country, and rap, was an even bigger hit, making the Top 40. It even became the theme song of WCW's Jeff Jarrett. Rock's next single, the slow back porch blues ballad "Only God Knows Why", was the biggest hit off the album, charting at No. 19 on the Billboard Hot 100. It was one of the first songs to use the autotune effect. By the time the final single, "Wasting Time", was released, the album had sold 7 million copies. Devil Without A Cause was certified 11 times platinum by the RIAA on April 17, 2003. According to Nielsen SoundScan, as of 2013, actual sales are 9.3 million. Kid Rock was nominated as Best New Artist at the 2000 Grammy Awards, but lost to Christina Aguilera. He was nominated for "Bawitdaba" for Best Hard Rock Performance, but lost to Metallica's "Whiskey in the Jar". In 1998, Ice Cube released his long-awaited album War & Peace Vol. 1 (The War Disc) which had some elements of nu metal and rap metal on some tracks. The album debuted at No. 7 on the Billboard 200 chart, selling 180,000 copies in the first week. The nu metal band Limp Bizkit's 1999 album Significant Other climbed to No. 1 on the Billboard 200, selling 643,874 copies in its first week of release. In its second week of release, the album sold an additional 335,000 copies. The band's follow-up album, Chocolate Starfish and the Hot Dog Flavored Water, set a record for highest week-one sales of a rock album with over one million copies sold in the U.S. in its first week of release, with 400,000 of those sales coming on its first day, making it the fastest-selling rock album ever, breaking the record held for 7 years by Pearl Jam's Vs. That same year, Papa Roach's major label debut Infest became a platinum hit. Cypress Hill incorporated direct heavy metal influences into their 2000 album Skull & Bones, which featured six tracks in which rappers B-Real and Sen Dog were backed by a band including Fear Factory members Christian Olde Wolbers and Dino Cazares and Rage Against the Machine drummer Brad Wilk. B-Real also formed a rap metal group, Kush, with Wolbers, Fear Factory drummer Raymond Herrera and Deftones guitarist Stephen Carpenter. According to B-Real, Kush is more aggressive than other bands in the genre. SX-10, formed in 1996 by Sen Dog, also performs rap rock and rap metal. 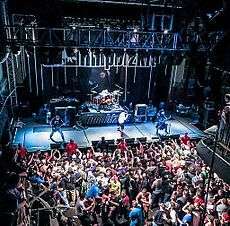 In 2000, the rap metal band P.O.D. 's 1999 album The Fundamental Elements of Southtown went platinum and was the 143rd best-selling album of 2000. Late in 2000, Linkin Park released their debut album Hybrid Theory, which remains both the best-selling debut album by any artist in the 21st century, and the best-selling nu metal album of all time. The album was also the best-selling album in all genres in 2001, offsetting sales by prominent pop acts like Backstreet Boys and N'Sync, earning the band a Grammy Award for their second single "Crawling", with the fourth single, "In the End", released late in 2001, becoming one of the most recognized songs in the first decade of the 21st century. The rap rock band Crazy Town also broke into the mainstream success of nu metal with their 1999 album The Gift of Game, especially their number 1 hit single, Butterfly, which peaked at number 1 on many charts including the Billboard Hot 100 during March 2001, remaining on the Hot 100 for 23 weeks. It also peaked at number 1 on the Modern Rock Tracks chart and the Hot Dance Singles chart as well as peaking number 6 on the Rhythmic Top 40, number 2 on the Top 40 Mainstream chart and number 4 on the Top 40 Tracks chart. Their album The Gift of Game peaked at number 9 on the Billboard 200. Worldwide the album sold more than 2.5 million units, with more than 1.5 million in the US alone. Also that year was Saliva's Every Six Seconds which was also a commercial success, debuting at no. 6 on the Billboard 200. In 2001, the band P.O.D. 's Satellite album went triple platinum and peaked at #6 on the Billboard 200 chart. ↑ Alex Henderson. "Primitive Epic - Bobaflex". AllMusic. Retrieved February 23, 2016. 1 2 Henderson, Alex. "Rap-Metal". AllMusic. Retrieved June 24, 2008. ↑ Erlewine, Stephen Thomas. "Review of Licensed to Ill". AllMusic. Retrieved December 31, 2008. ↑ Huey, Steve. "Review of Black Sunday". AllMusic. Retrieved December 31, 2008. ↑ Keyes, Cheryl Lynette (2002). "Blending and Shaping Styles: Rap and Other Musical Voices". Rap Music and Street Consciousness. University of Illinois Press. p. 108. ISBN 9780252072017. ↑ Ketchum III, William E. (October 15, 2008). "Mayor Esham? What?". Detroit, Michigan: Metro Times. Retrieved October 16, 2008. ↑ "Biography of Run-D.M.C.". AllMusic. Retrieved December 31, 2008. ↑ "24-7 Spyz! Threw reggae, rap, metal and positive vibes into a blender, then drank in the musical mix". Rocky Mountain News. November 22, 1991. Retrieved January 8, 2009. ↑ "Faith No More has more faith than its record company bargained for". San Jose Mercury News. July 31, 1990. Retrieved January 8, 2009. ↑ Peterson, Thane (September 26, 2000). "How Corrosive Is Heavy Metal?". BusinessWeek. Retrieved January 8, 2009. ↑ Gold, Jonathan (October 21, 1991). "Anthrax, Public Enemy Fuse Rap, Metal". Los Angeles Times. Retrieved January 8, 2009. ↑ "The Top 10 Christian Metal Bands". OC Weekly. Retrieved December 13, 2015. ↑ "Review: Psycho Surgery - Tourniquet - Cassette | Cross Rhythms". www.crossrhythms.co.uk. Retrieved December 13, 2015. ↑ "Mojo's Working — Rap-Rock Pioneers Are Back". Columbus Ledger-Enquirer. April 13, 2006. Retrieved December 9, 2008. ↑ Barnes, Brad (April 19, 2006). "Rap-rock pioneers have their 'Mojo' workin'". Columbus Ledger-Enquirer. Retrieved December 9, 2008. ↑ "Faith No More Album & Song Chart History". Billboard. Prometheus Global Media. ↑ "Raging Sales Put Rage Atop Billboard 200". Billboard.com. November 11, 1999. Retrieved October 30, 2008. ↑ "RIAA - Gold & Platinum: Searchable Database". Recording Industry Association of America. Retrieved October 29, 2008. 1 2 3 4 "RIAA Certifications for albums by Kid Rock: Gold and Platinum". RIAA.com. Recording Industry Association of America. Retrieved July 22, 2008. ↑ Billboard. Retrieved March 14, 2012. 1 2 Devenish, Colin (2000). Limp Bizkit. St. Martin's. pp. 95–113. ISBN 0-312-26349-X. ↑ Reese, Lori (October 24, 2000). "Bizkit in Gravy | Music". Entertainment Weekly. Retrieved July 29, 2010. ↑ Gill, John (March 10, 2000). "Cypress Hill Digs Up "Bones" With Rap And Rock". MTV. Retrieved December 31, 2008. ↑ Moss, Corey (April 23, 2002). "With Kush Record Done, B-Real Keepin' Real Busy". MTV News. Retrieved December 31, 2008. 1 2 Downey, Ryan J (November 27, 2002). "B-Real Finishing Up Kush LP, Going Grimmer For Next Cypress Hill Album". MTV News. Retrieved December 31, 2008. ↑ "SX10 tocara hoy en el DanZoo" (in Spanish). Mexico City: La Jornada. May 24, 2003. Retrieved December 31, 2008. ↑ "The Fundamental Elements of Southtown - P.O.D. : Awards". AllMusic. August 17, 1999. Retrieved January 1, 2013. ↑ "Billboard 200 Albums - 2000 Year End Charts: 141 - 160 | Billboard". Retrieved January 3, 2013. ↑ "Linkin Park - Hybrid Theory (staff review)". Sputnikmusic. September 2, 2006. Retrieved August 27, 2012. ↑ Sanneh, Kelefa (March 31, 2002). "MUSIC; New Ideas From the Top of the Charts". New York Times. ↑ "Complete List Of Grammy Nominees". CBS News. February 11, 2009. Retrieved August 27, 2012. ↑ "Crazy Town - Chart History". Billboard. ↑ "Crazy Town". MTV Artists. Retrieved February 23, 2016. 1 2 "The Gift of Game". AllMusic. Retrieved February 23, 2016. ↑ "P.O.D. Billboard Albums Chart". billboard.com.